Mom makes a mean mutton keema pulao. She’s fast, unfussy and does not follow recipes. Her repertoire of pulaos (pilafs) and biryanis is extensive yet each every single one is cooked from memory backed-up by instinct. On my last visit, as I watched her put together her mutton keema pulao, I felt a strong urge to share the recipe. 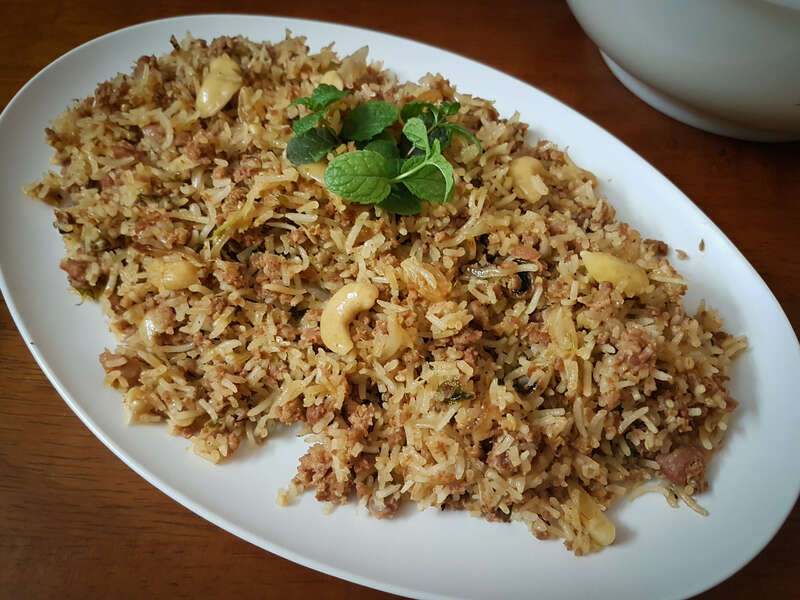 Busy moms everywhere could learn how to make pulao in a rice cooker and use this tried and tested keema pulao recipe to whip up a special meal without spending hours in the kitchen. As a gynecologist with a non-governmental organization treating people afflicted by HIV and leprosy, Mom has a schedule that makes big demands of her time and energy. Despite this, she pampers us with delicious meals every time we visit. She goes about her cooking in a practical, “get the work done” kind of way. You won’t find her lingering over ingredients, smelling the aroma of mint. So, to put together this recipe I had to watch her like a hawk, and badger her with countless questions. This keema pulao recipe is precious and I had to document it so that I could pass it on to my son and his family some day. This pulao (pilaf) is rich enough to make a one-dish meal and is especially suited for Sunday lunches with the entire family. A cool, raita is all the accompaniment it needs. 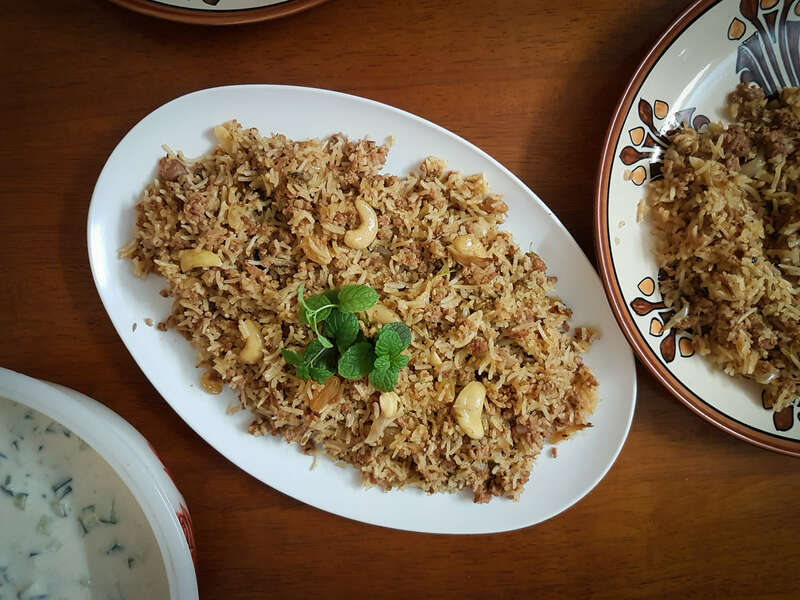 Generously dotted with juicy morsels of mutton keema or lamb/goat mince, cashew nuts, almonds and raisins and cooked in pure ghee, the pulao does well as a celebratory main course. It’s important to use good quality ghee and not oil because ghee makes everything taste and smell so much better. Add a teaspoon of ghee next time to your plain steamed rice and you’ll know exactly what I mean. Coming to the choice of meat, we in India prefer goat meat that is widely available here. Goat is chosen for its leanness (the desired proportion of fat to meat) and flavor but lamb mince works equally well. The mutton keema must not be too fatty or too lean. A fat percentage of 30 percent is ideal. This is a working woman’s recipe so the mince can be fried ahead of time and cooked with the rice just before eating. Prior to cooking, the mutton keema is marinated overnight to allow it to soften and absorb the flavors of the marinade. The marination gives the pulao a deep, meaty deliciousness that belies the plain appearance if the dish. This keema pulao recipe has 2 straightforward steps post marination. The first involves frying the mutton keema with onions to sear and seal in the moisture. Frying the rice with onions and whole spices is the second step. As a result, the rice becomes toasty and aromatic. Finally, before everything goes into the cooker, the rice and the caramelized yet still juicy meat are sauteed for a few minutes so that they get to know each other. The browning brings out the sweetness of the onions and the meatiness of the mutton keema so that it coats and infuses every grain of rice with the mouth-watering, savory essences of the meat. After this, all that is left to do is to put everything into the rice cooker with water and allow the magic happen. No matter how many times I’ve enjoyed this pulao, I’m always amazed how this dish with no special technique or secret ingredient tastes so fantastic every time. Mom’s cooking I guess. Nothing quite like it in the whole wide world. This looks so delicious. We love goat, but by us it’s not as popular of a protein. We are all about no fuss recipes so I will add this to the “to make” list and let you know how it comes out. thanks for sharing! Shored up my confidence hugely in trying out meat pulao in cooker for the first time. I was apprehensive all the while till I opened the lid and everything looked, blended and tasted in harmony !